On this date in 1963, hardened killer Frederick Charles Wood, 51, became the next-to-last prisoner to be executed at Sing Sing Prison in New York. 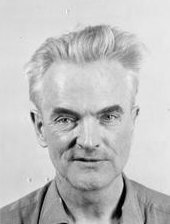 Although he came from a respectable, law-abiding family, Wood had a terrible temper and was very experienced at homicide. The man’s murderous career makes him the perfect poster child for the death penalty. He committed his first murder while he was in his mid-teens, poisoning a girlfriend. He was out in only a few years, however, and fell back into crime: in 1933, he committed another horrific slaying. This time his victim, also female, was a stranger. Wood reportedly beat her with an iron bar and crushed her skull, and stabbed her over 140 times. He served seven years and was paroled in 1940. In 1942, he killed again — for the third time. Wood attacked a man, hit him with a beer bottle, stomped on his head and slashed his throat. The victim, he said, was bothering his girlfriend. This time he served almost twenty years before he was paroled again in 1960. Mere weeks after his release from custody, in New York City, Wood beat and slashed a 62-year-old acquaintance to death, supposedly because his victim had made a pass at him. He then slaughtered the man’s 78-year-old sleeping roommate. This article provides a detailed account of his crimes and execution, comparing him with Timothy McVeigh. On that day in 1963 my father George J.was one of the prison officers that walked Mr.Wood to the chair. I came across a very similar case from across the pond in the UK, in a book I was reading today called “Murder & Crime: Kingston Upon Hull.” In the first half of the 20th century a man (can’t remember his name) murdered three women one after the other. In each case it was a wife or cohabiting girlfriend. In each case he killed them rather brutally out of jealousy. In each case he was convicted of manslaughter, served a prison term of some years, then was released. He would have gotten an automatic death sentence if convicted of murder. The second and third times the jury didn’t know about his previous record. (It’s safe to say that neither did his luckless partners.) By the third time the judge, who DID know about his record, had had it and sentenced him to the maximum term of life in prison for manslaughter. But he was paroled anyway and died a free man. What’s the “it” here? Four fewer murdered people? I honestly do not believe so. A violent society—never more accurately expressed as through the death penalty—CREATES murderers. The hang-em-highs hate to hear this but it’s true. JCF believes there’s NO room for violence in society; that all violence is evil, when it’s not. Violence used against innocent people is evil. But violence used against evil folks is not. Gee, I wonder what JCF would do, if he had a gun in his hand, and he saw a madman with an axe in his hands running for a child. And he knows that the only way to stop that beautiful and innocent child from being killed, is to raise that weapon, fire and kill the madman. Oh, what a violent act that would be; and one that would be divinely appropriate. For if he doesn’t man-up and kill that man, the beautiful child will die. And the parents will be grieving forever. And so in this case, as in millions of cases around the world, violence can be a wonderful thing, and one that normal people need to embrace. JCF’s way of thinking is both stupid and dangerous. Yesterday I was in one of my usual bookshops in Paris for buying a book about a cinema magazine of the 1960s and on the same table I saw and purchased as well another book. Rather thin, 90 pages, and small in format. But the subject is some real-life criminal cases which have inspired movies featuring serial killers on the screen. I am copying here the list of chapters. For each, the first phrase refers to the real case, the phrase below to the movie. Of course the same case may have inspired other films mentioned or not in the chapter. In brackets is the name of the killer in real-life, which I have looked at each time. Meaghan! You know me!! I had to respond, LOL! No, I’m like you: I don’t see Wood as a serial killer. See you after my next comment, LOL! Question for you: in your opinion, does Mr. Wood count as a serial killer or not? I mean, yes, he killed multiple people individually over an extended time period, but the murders themselves don’t seem very “serial” to me. He should have been killed after the first murder. That would have solved it. The bleeding hearts hate to hear this but it’s true.